I think your fantastic shot of this very elusive bird-as with much of birdwatching-is lots of luck! Lucky you to be able to get such a shot. Thanks for your comments, I must say I think I was overdue for a slice of luck! With the run of windy weather, I haven't had many photo ops. lately, so I was doubly pleased, although I would like the chance to get better shots. Alan, a nice shot of a very difficult to photograph species. They are so small, wary and fast, it is quite a feat to get a usable photograph of one. I would be interested in hearing about how you are finding the sigma 50-500, having considered this lens myself a a good way to get more focal length at "relatively" little cost, was this shot taken with it? Interesting comments regarding the Clamorous Reed warbler, I have not seen them around Gould's in winter, but if they are not calling actively, they would be difficult to spot. Also, have you considered contributing to Wikipedia? I have just written a brief article on the native-hen(http://en.wikipedia.org/wiki/Tasmanian_Native-hen), but there are many other Tasmanian bird articles needed, and photos too. Thanks for your comments and questions. I did indeed take the shot of the Little Grassbird with the 50-500 lens. I don't think it's the best, but most probably the most cost effective way to get 500mm lens without selling the house! The only other option, for you, would be the Canon 100-400mm, which is probably a better all round lens, but more expensive. 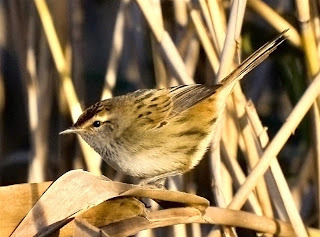 I have heard the Clamorous Reed-warbler calling in the middle of Winter, most recently on the Tamar River. They were still present at Gould's in late April and calling, and as you say, they're not easily seen. I haven't considered contributing directly to Wikipedia, but this blog is the link for Tasmanian Birds, so perhaps I could be considered to be a contributor! I do seem to get better support from around the World than I do from Tasmanians, which is one reason I'm contemplating on moving to a website rather than a blog.